New York Magazine already has the best New York City website out there, but the cool thing is, they’re not resting on their laurels. I just noticed this new(ish?) 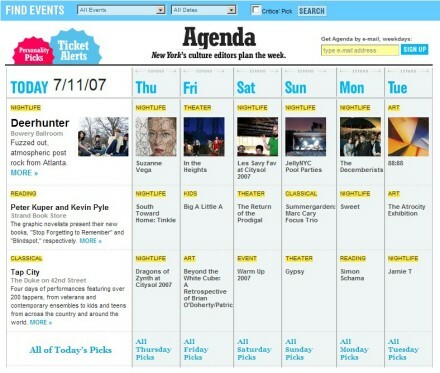 feature today called the “The Agenda” where the NY Mag culture editors plan your week. It’s not comprehensive, (that’s why it’s edited of course), but it looks pretty good to me. If you’re searching for things to do in the city, aside from yours truly, I also can suggest Upcoming.org, Going.com, UrbanEye, Nonsense NYC, and MUG.